After the destruction of old St Paul’s in the Great Fire of London, it took 50 years of design and construction to build a new cathedral. Wren was in charge of the project from beginning to end and the centrepiece of his creation was the first large masonry dome ever to be constructed in Britain. This part of the exhibition explores the final sequence of drawings that determined the shape of the dome and, in particular, its sloping inner drum. The design was influenced by contemporary mechanical theory and represents a breakthrough in modern structural engineering – one of the first recorded instances in which mathematical science, in a form worked out prior to the design process, was ‘applied’ to an actual building. Aside from their purely technical content, the dome drawings also reveal the nature of his working relationship with his draughtsmen and the way he dealt with mounting concerns over expenses. His status closely resembled our own notion of the head of an ‘office’. 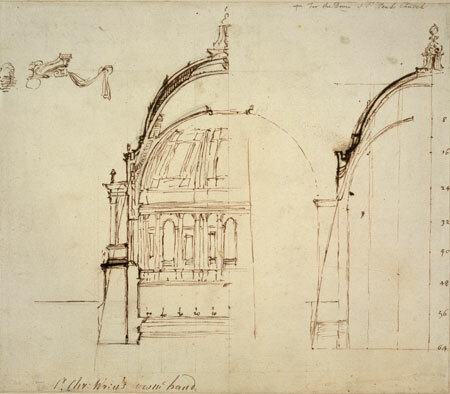 One of the innovations that he developed at St Paul’s was the use of working drawings for individual elements, decorative schemes, and even details. The great wealth of surviving drawings points not only to the project’s size and complexity but also to an unprecedented level of centralization in the design process.